This is an advertisement for an evenings entertainment at St Phillips School in Kennington, London. During the 19th century there was an increase in the amount of leisure time available to the working and middle classes and this combined with an increase in disposable income to create the fashion for visiting theatres and music halls. As well as these official forms of entertainment there were also many smaller halls in which amateur dramatics groups put on plays to raise money for charities or to fund their clubs. 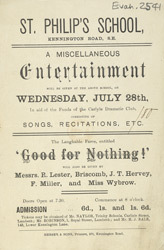 The play featured on this leaflet ‘Good for nothing’, was being staged to raise funds for the Carlyle Dramatic Club.